You might be surprised to learn that the speech patterns in Moscow and Vladivostok, separated by 9,000 km, are more similar than in Moscow and Ryazan, only 200 km apart. The people who inhabited Ancient Russia, or Rus, were mostly illiterate, had no dictionaries to check word usage, and didn't bother too much with rules. Therefore, prior to the 14th century, the preliterary Old Russian language was, by definition, based on oral traditions: it was spontaneous and didn’t rely on fussy academicians laying down the law. By the 14th century, Rus was a patchwork of feudal principalities. Despite some of them languishing under the Tatar-Mongol yoke, the Old Russian language continued to develop. In geographically proximate regions, speech began to develop in different ways, and three dialects gradually emerged: Ukrainian, Belarusian, and Russian. Each of them eventually evolved into a separate language, and the three of them now make up the closely related Eastern Slavic languages, a branch of Indo-European. Although Russia is vast, linguists distinguish only three groups of Russian dialects: northern, southern, and central, with the latter heavily influenced by the other two. 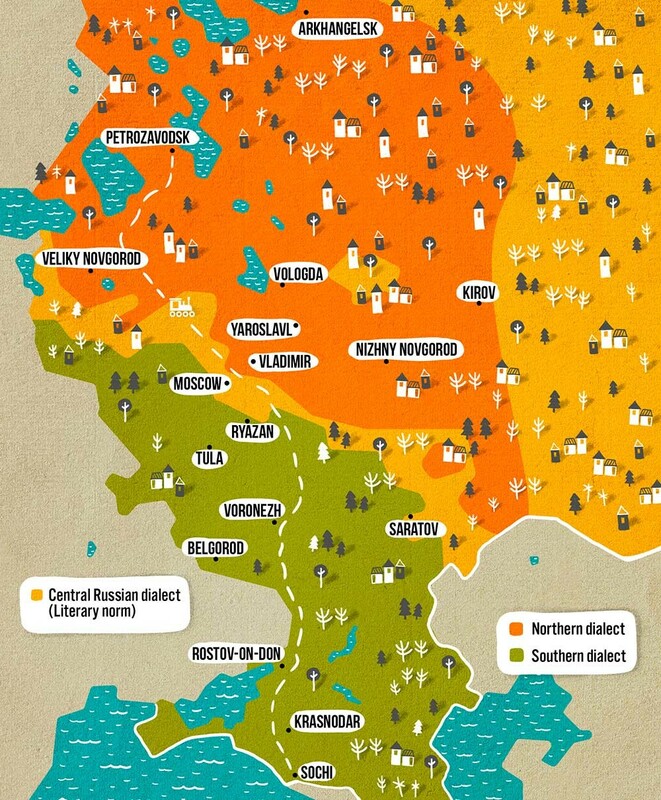 Igor Isayev, director of the Institute for Linguistics of the Russian State University for Humanities, says that the old dialects in the east of Russia can be tentatively divided by drawing a line across the central European part of the country from Vyatka (Kirov), through Nizhny Novgorod, to Saratov in the south. All dialects east of this border—which means the whole of the Urals, Siberia, and the Far East—were formed on the basis of the dialects of the earliest settlement of Slavs. This is the language of settlers from central Russia, which has changed little over the ages. Therefore, you won’t feel a huge difference between the speech patterns in Vladivostok and Moscow, whereas travelers between northern Arkhangelsk and southern Krasnodar will have to retune their ears. The so-called literary language is spoken in all major cities of Russia, which is contributing to the gradual erosion of the archaic dialects of the late 19th century. And yet no one could say that all Russians speak the same way. Colloquialisms and vernacular expressions are easy giveaways, especially in villages and small towns and among older people. But these distinctions will never be as strong as in different regions of, say, Italy or even more so China. Except for a few odd words, all Russians understand each other. The literary norm is the Central Russian dialect, the way they speak in Moscow. That’s because Moscow was the capital of Ancient Rus. “If power had remained concentrated in Vladimir and Suzdal, where the northern dialect was spoken, as things stood at the end of the 13th century, we would all be speaking this dialect today,” asserts Igor Isayev. “If you take a train, say, from Petrozavodsk to Sochi, i.e. 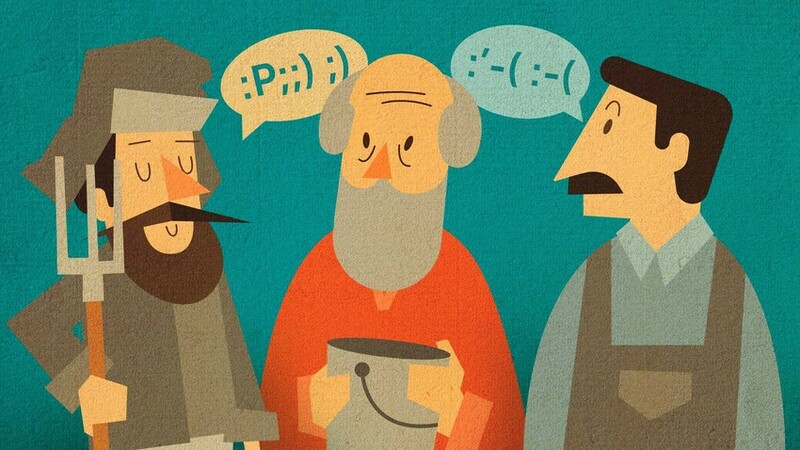 north to south, you will hear several variations of Russian dialects: some will say ‘o’ instead of ‘a,’ or ‘ts’ instead of ‘ch,’ or ‘kh’ instead of ‘g,’” says Nelly Krasovskaya, a professor at Tula University. One of the most striking characteristics of the southern dialect (Ryazan, Kursk, Voronezh, Belgorod) is the so-called “gekanie” phenomenon, or in academic parlance: “fricative g.” It is designated by the Greek gamma sign γ, but pronounced as a soft “kh.” More often than not, it is a devoiced “g” at the end of a word in front of a vowel. For example, instead of “snega” (literally “of snow”) people say “snekha.” The further south you venture, the deeper and more guttural the “g” becomes, and it even starts appearing at the beginning of words. In Krasnodar, for instance, you might hear “khorod” instead of “gorod” (“town/city”). Incidentally, even further south, in Ukraine, “gekanie” is the literary norm. This feature is typical for the north and south of Russia. For example, peasants on Leo Tolstoy’s estate at Yasnaya Polyana called their master “grakh” instead of “graf” (“count”). Read more: How many people around the world speak Russian?